An excellent way to get the lay of the land and canals. The narration was helpful, too, and available in multiple languages. Great way to get around the city and stop at your favorite locations. Two different routes. Very relaxing and nice boats. Museum is a must see. Stop for dessert in their cafe. Very easy and convenient way of seeing or reaching all the areas in central Amsterdam. Very convenient with frequent pickups and stops in all the places you'd want to visit. Nice to combine the museum with the boat tour. The Rijksmuseum was nice and we could have spent a longer time there. The hop on/off boat had 5-6 stops which probably wasn't ideal. Loaded on the western side of the canal and weren't many stops on the eastern side. 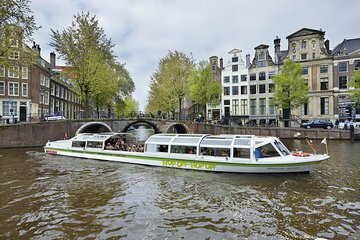 This is the way to see Amsterdam! We loved it and you can get off and on as you like. We enjoyed this tour very much and highly recommend it! Loved Amsterdam and the 48-hour Viatour hop-on hop-off boat tour was the best way to kick-off the adventure! The waterway tour gave us a chance to map the city and know where we wanted to go and how water shapes the city. The audio was very helpful although it may have been best to have an audio-set to limit the narrative to one specific language at a time. Highly recommended as a tour! It was very easy to change our vouchers for tickets and find the museum canal boat. The museum boat gave us a chance to take some photos of Amsterdam and see some of the sights on the way to the Rijksmuseum. Having tickets for the museum saved us queueing , which was important because we were only on a day trip. The museum canal boat does a circular tour so we had chance to see more sights on the way back to the station. This tour was great for a days vist to Amsterdam. Good choice so wee could hop off or just enjoy the whole trip several times. Only problem was the construction in the area so had to walk further to another stop...nothing to do about that. Information on the bus was good and audible.